"Latkes (potato pancakes) are a must have at Hanukkah, but really are wonderful any time of year! This is my mother's recipe, which is honestly the best latke I've had. I usually end up having to make a second batch because they disappear so quickly. I've tried other recipes and always return to these. 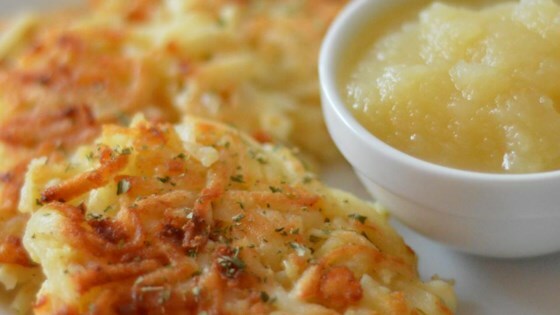 Lovely topped with sour cream or applesauce." I did not have saltines, so used flour and increased the salt. Added some garlic too. this recipe is great I did learn a new trick to them crispy and less greasy use a hand towel or cheese cloth to remove extra water from the potatoes by squeezing them.